I can never get enough of looking at color inspiration. 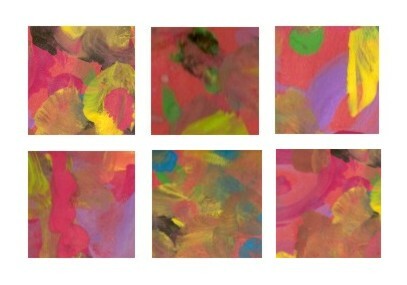 I need more of the small paintings in bright colors, because Michael Murphy Gallery just sold seven of them (Yay!) And while I’ve never been timid about color, I want to be even more outrageous and over the top with it. So I’m always looking for unusual combinations. 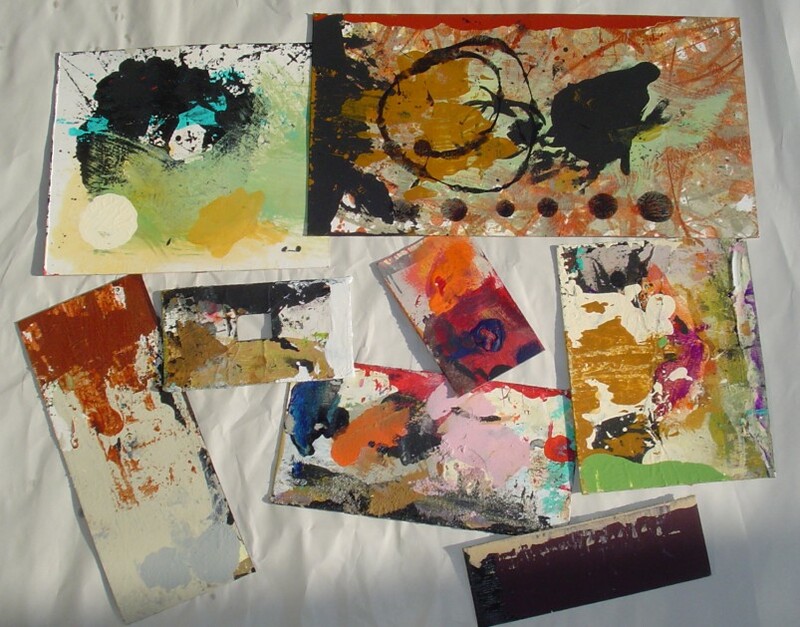 One obvious place for unusual and exciting combinations is right in my old paint palettes made from plastic plates. I keep them all. And another good place to look is on my used mat board squeegees. And kids’ art is always wonderful for color applied with abandon. I’ve shown this before, but these are some crops from a painting my granddaughter did on a piece of orange construction paper. I still have the original. I also love to look at Matisse’s paintings and collages. Or you could play on Color Schemer. You can try different combinations online, or you can download the program. Where do you go for color inspiration? Great post! I also often get color inspiration from the random color patterns on my paint palettes. Seth, that is the best way I’ve found. They surprise me all the time. Last week and this week I have rejuvenated some dried out watercolor and gouache tubes and have put them in little jars so I have more than ample paint ready. Then I have gone through old paintings and have revised them with some brush strokes of bold wet color. I discovered that I am much freer in color choices after the paints were fin storage for a few years. Nice ways to connect with color, Diane! So sorry they didn’t work. I didn’t code it right, but I do appreciate your sharing this link! Where do I go for colour inspiration? Very low-tech, I get out my various paint tubes and having decided on a main colour I’ll group different ones together until I have the combination I want. Congratulations on selling 7 of your lovely paintings! I’ve put yesterday’s painting up on my computer, in this case it was the composition that inspired me. Sandra, thanks for the good thought! I might try your lining up paint tubes method. I too look to Matisse’s cut outs for inspiration. I love looking in catalogs (IKEA/Crate & Barrel/West Elm), Home Decor magazines (Elle Decor/Metropolitan Home) and even fashion mags (Harper’s Bazaar is my favorite!) for color combinations, patterns and style/design trends that inspire me. Yeah, do that, John! I’ll be watching for it. I can definitely see the Matisse influence, by the way! Hi Martha. I’m stopping by to deliver a couple of blogger awards to you, “The Honest Scrap Award” and the Lemonade Award.. In the great spirit of the blogging community these 2 awards were given to me and to be passed along to 7 blogs that I find brilliant. You are definitely one of them. Details at the post. Thank you Carole! I’ll stop over there and have a look.